TLC NAND has been a performance drag, until now. 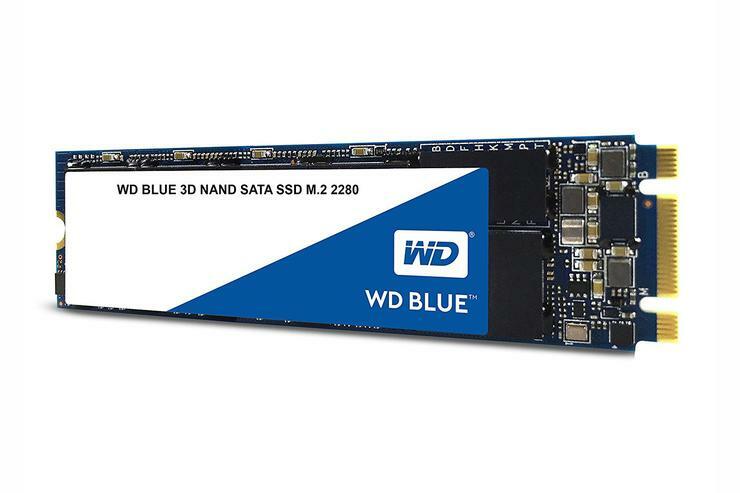 The WD Blue 3D SSD is a SATA SSD with a not-so-secret twin: Sandisk’s Ultra 3D SSD. They are in fact the same drive with different labels, WD owning Sandisk and all that. The ‘3D’ term means the drives use stacked (layered, vertical, etc.) NAND. Practically speaking, that means more storage in less horizontal space. The only real differences between the drives are the outward appearance, the marketing, and the fact that the WD Blue 3D ships in the M.2 form factor, while the Ultra 3D does not. Beyond that, they’re peas in a pod. Given their superior performance compared to other TLC NAND drives—that’s a really good thing. Though available in the 2.5-inch form factor, WD sent us the M.2 2280 (22mm wide/80mm long) Blue 3D, which is handy for upgrading laptops or desktops that feature an M.2 slot. It’s SATA, not NVMe—just to be clear. Be sure to check which flavor your M.2 slot is before you buy. Just FYI, NVMe is a lot faster. The Blue 3D is available in 250GB, 500GB, 1TB (the size we tested), and 2TB capacities, which sell for $95, $165, $310, and $620 respectively. Those are the prices from WD’s site—you may find them cheaper at Amazon, Newegg, or the like. 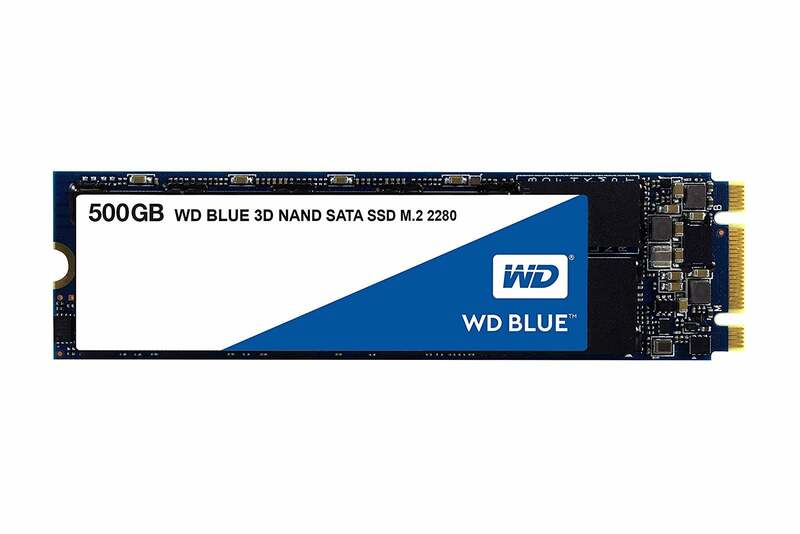 The Blue 3D is warrantied for three years and rated for 100TBW for every 250GB. That means WD expects you can write 100 terabytes to the drive before experiencing any loss of capacity due to wear and tear on the cells. If you do the math, that’s actually a heck of a lot of writes. Probably more than 10 years' worth for most users. And TBW estimates are generally very conservative. We tested the 1TB version of the WD Blue 3D, not the 500GB version shown, but we liked what we saw from out benchmarks. Note that the 250GB version is rated slightly slower than the other capacities. That’s common with most drives of 250GB or less, which most often have fewer chips to spread data across. We test SSDs using both artificial benchmarks, primarily AS SSD and CrystalDiskMark, and real-world copy tests. We’re happy to report that somehow, to the benefit of users everywhere, WD/Sandisk has managed to create a TLC drive that can sustain 450MBps performance during long writes. Up until now, about the fastest sustained write speed we've seen out of a TLC drive after it oversteps it's cache is 300MBps. Indeed, after testing with our usual 20GB data set, we threw 320GB at the Blue 3D, and it just soldiered on at a steady 450MBps. There may be a point at which the drive will slow down, but we didn’t see it. By way of comparison, the Samsung 750 EVO drops to 300MBps when it runs out of cache, was considered good. Some drives, such as OCZ’s Trion 100 and even Toshiba’s latest TR200, drop to around 100MBps—slower than hard drive speeds. Yowser. CrystalDiskMark tests the SSD with all caching engaged and is generally a good indicator of real life performance. We run the test with 1GB, 5GB, and 32GB data sets. The differences between these three drives are minimal, not unexpected given that the Sandisk and WD are actually the same drive in different form factors. Note that the Crucial BX300 (red bar in the graph above) is an MLC NAND-based drive. from which we nearly always see 450MBps to 500MBps writing simply because writing MLC's two bits takes less time than TLC's three bits. At least until now. 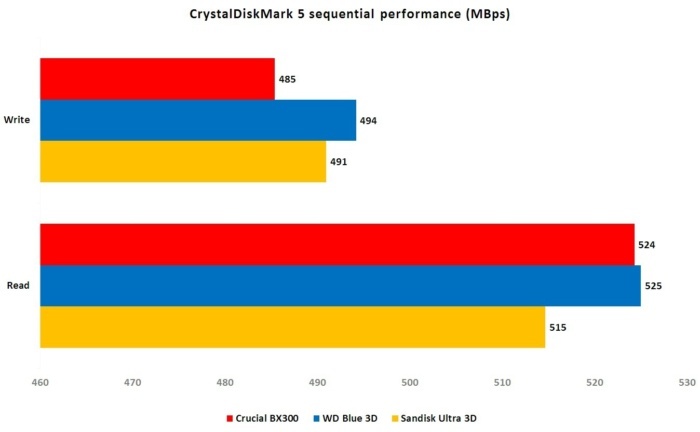 The WD Blue 3D (blue bar) and Sandisk Ultra 3D (yellow bar) keep up with it nicely. 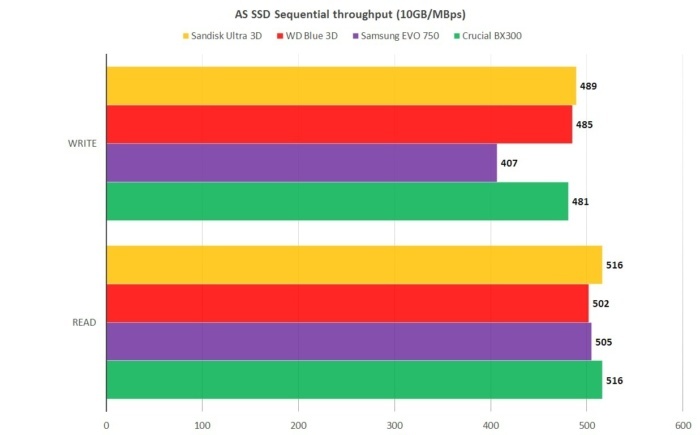 The AS SSD test results show the Samsung 750 SSD looking a little slow. The AS SSD benchmark issues the FUA (Force Unit Access—disabling caching in units that acknowledge the command) and is especially useful in determining the bare-knuckle performance of the controller and NAND. We run both AS SSD’s 1GB and 10GB tests, quoting the 10GB test results. As you can see in the chart shown above, the WD Blue 3D and its Sandisk Ultra 3D twin mirror each other closely, and keep up with the Crucial BX300. 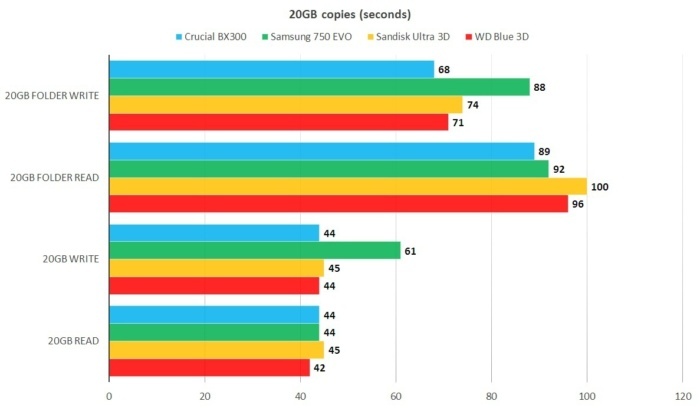 They all make the well-regarded (but pricey) Samsung EVO 750 SSD look slow. Our real-world tests consist of reading and writing both a 20GB single compressed archive and a 20GB set of small- to mid-sized files and folders, with the majority of the files being compressed types such as WMV, MP3, and JPG. The real-world copies can, and have, revealed issues like the slow sustained write speed of TLC that synthetic benchmarks can sometimes miss. Only a few short months ago, the Samsung EVO series was the bomb in the entry-level market. Now it’s slower than the Crucial BX300, Sandisk Ultra 3D, and WD’s Blue 3D. For us, the great thing about the evolution of TLC performance is that once again, we can recommend on price without constant disclaimers concerning poor sustained write performance. For the consumer, it means large-capacity 2TB SSDs with great all-around performance. We have nothing negative to say about the WD Blue 3D. Okay, the label is boring, which isn't trivial if you're building your own PC and want to show off all your hardware finery through the tempered-glass, LED-lit side of your case. But it's fast, affordable, and available in up to 2TB capacities, and we’re impressed with whatever trick Sandisk/WD used to eliminate the MLC/TLC performance gap.